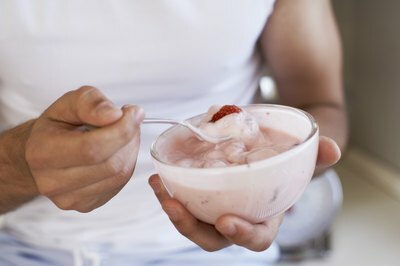 Low-fat yogurt makes a nutritious, high-protein vegetarian snack. 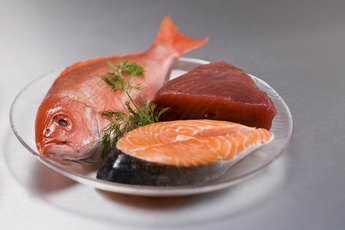 Protein foods should account for 10 to 30 percent of your daily calories, according to the federal 2010 Dietary Guidelines for Americans. With 4 calories in 1 gram, this amounts to 50 to 150 grams for a 2,000 calorie daily diet. Vegetarian protein foods include beans, nuts, seeds, soy and sometimes dairy products. These foods make nutritious, high-protein snacks. However, be mindful of their fat and caloric content. 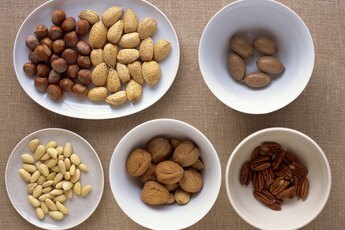 Nuts and nut products are a good protein source for vegetarians. These nutrient-dense snacks derive most of their calories from fats but are also a rich source of protein. To reduce their impact on your daily intake of sodium, fats and calories, choose unsalted and dry-roasted varieties. Dry-roasted, unsalted almonds, for example, contain 7.3 grams of protein and 18 grams of fat in a 1/4 cup serving. By comparison, the same size serving of oil-roasted almonds provides 8.3 grams of protein and 21.7 grams of fat. Legumes are an essential part of a high-protein, vegetarian diet that's rich in all essential amino acids. Examples include lentils, soybeans, peanuts and beans. Snacks that are made with or contain large amounts of legumes are high in protein. For example, you can spread a 2 tablespoon serving of smooth, unsalted peanut butter on celery to obtain 8 grams of protein and 16.1 grams of fat. Edamame, a low-fat, high-protein soybean snack, can be eaten alone or in salads and stir-fried vegetarian dishes. A cup serving of cooked edamame contains 16.9 grams of protein and 8.1 grams of fat. Similar to nuts and peanuts, seeds are a high-fat, high-protein vegetarian snack. You can mix smaller raw or dried seeds into yogurt and smoothies to boost the protein content. Larger raw seeds make a good addition to salads and snack mixes, while roasted seeds are tasty on their own. A half-cup of roasted, unsalted pumpkin seeds contains 5.9 grams of protein and 6.2 grams of fat. In comparison, a 1-ounce serving of small, dried chia seeds provides 4.7 grams of protein and 8.7 grams of fat. Dairy products, especially cheese and yogurt, can be high-protein snacks that are suitable for vegetarians. However, in contrast with the high unsaturated fat content of legumes, nuts and seeds, many dairy products contain large amounts of potentially unhealthy saturated fats. So, choose low-fat or nonfat diary snack options. For example an 8-ounce container of low-fat vanilla yogurt contains 11.2 grams of protein, 2.8 grams of total fat and 1.8 grams of saturated fat. By contrast, an 8-ounce container of whole-milk yogurt provides 7.9 grams of protein, 7.4 grams of total fat and 4.8 grams of saturated fat. Nutrition Almanac, Sixth Edition; John D. Kirschmann and Nutrition Search Inc.